In 1907, the president of the Metropolitan Life Insurance Company, John Rogers Hegeman, commissioned the firm Napoleon LeBrun and Sons to design a campanile-style tower for the expansion of the company headquarters. Construction began later that same year, and in 1909, the building opened, advertising the company's status as s the largest insurer in the world. With its slender shaft, high-pitched roof and lantern, the tower of the Metropolitan Life Insurance Company evokes the famed bell-tower of San Marco in Venice. First planned to be 658 feet, the final height stretched to 700 feet. Sheathed in white Tuckahoe Marble, the tower rises above Madison Square at 23rd Street and Madison Avenue where at night the "light that never fails" glows from its lantern, flashing the hour and quarter-hour. In 1960-61, the tower was subjected to an aggressive remodeling campaign in which most of the classical detail was stripped off, including balconies and a prominent cornice. The marble facade was replaced with sheer limestone panels so the Tower would match the modernized base. 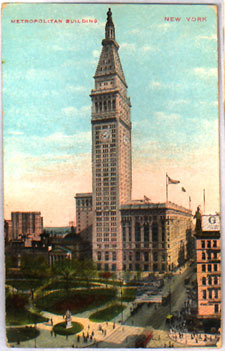 Today, the four clock-faces remain the only memory of the ornate facade, though, the proud tower still d remains a defining element of the midtown skyline.